Don’t build in vain. Learn how to daily depend upon the Lord – whether in the impossible or the possible -and see your life bear lasting fruit. Psalm 44:5–8 says, “Through You we will push down our enemies; through Your name we will trample those who rise up against us. For I will not trust in my bow, nor shall my sword save me. But You have saved us from our enemies, and have put to shame those who hated us. In God we boast all day long.” “Some trust in chariots and some in horses, but we trust in the name of the LORD our God. They are brought to their knees and fall, but we rise up and stand firm” (Psalm 20:7–8, NIV). It is important for us to understand that the Lord rejects a work dependent on any thing or any person other than Himself. God desires that we always look to Him, never relying on our own strengths and abilities or depending on anything apart from Him. Be it our talents, friends, family members, buildings, money, or the resources of other people—none of these should become the source of our trust. God uses these as means to help us in our times of need and to further His Kingdom, but ultimately He is the only one whom we can depend on. Our abilities, skills, talents and backgrounds have no relationship to how much God can use us. God is almighty and He can do anything, but He has chosen us to partner with Him. He seeks us as jars of clay—channels for His work. God uses us to do His eternal work based on one criteria: our willingness to depend on Him and give Him the glory. The greatest saints are simply the greatest receivers. Relying upon the Lord, they are nothing but channels; they know this and give God all the glory. The more naturally gifted one is, the more he or she must go through death to self and pride in order to be used by God. Our ego is so deceitful. All the talents and natural abilities given to any of us were given by God in the first place. Yet we so easily take ownership of these things and attribute them to ourselves. We must realize that God always seeks to bring us to the place of death so He can work through us (see Galatians 2:20). When we surrender our abilities to God, we become partners with Him, and He accomplishes great things through our lives. It is possible to begin with absolute trust and dependence upon God and later to be led astray, thinking we had something to do with the victories. In the midst of great blessings, we can be rejected by God because of our pride. As we saw in Chapter 2, King Saul and King Uzziah both fell because of this. God can do great things through us, but we cannot take credit for what is His. Paul did amazing miracles, established churches throughout Asia and led hundreds to Christ, but he also said truthfully of himself, “I know that nothing good lives in me” (Romans 7:18, NIV). We are merely the instruments of God. On the outside, something can look very wonderful (like King Asa’s victory) but in actuality be very displeasing to God. Nebuchadnezzar built a large and beautiful city, but does it stand today? Where is the Tower of Babel in our history? It is a remembrance only of the sinfulness of good-intentioned flesh. We need to keep in mind that that which is esteemed before men is despised by God. If anything in our life or ministry is to count for eternity, it will come forth from Christ as we are dependent upon Him. What a lesson for us all to learn! I encourage you, my brothers and sisters, learn the strength of God, which is stronger than man; learn the wisdom of God, which is wiser than man. “Trust in the LORD with all your heart, and lean not on your own understanding; in all your ways acknowledge Him, and He shall direct your paths” (Proverbs 3:5–6). We began well by trusting in the Lord. Let us now continue in His strength and live in His blessings. Dear Lord, please show us parts of our lives, whether big or small, where we have not looked to You, depending on Your grace and strength. Father, we want to please You by living lives that bear good fruit. Help us do that and to know You, and in knowing You, depend on You, giving You the glory for the work done in and through our lives. Thank You for being God, all-powerful and all-knowing. Thank You for having ways that are higher than ours and for teaching us of those ways. Help us to humble ourselves and depend on You for everything. Be glorified in our lives, O Lord. In Jesus’ name, Amen. This entry was posted in Dependence Upon the Lord and tagged Bible, Christianity, dependence, Discipleship, gfa, Gospel for Asia, holy spirit, Hope, Jesus, Jesus Christ, K.P. Yohannan, ministry, Missionaries, Missions, service on July 6, 2010 by gfaseo. This entry was posted in Dependence Upon the Lord and tagged Bible, Christianity, dependence, Discipleship, encouragement, gfa, Gospel for Asia, holy spirit, Hope, Jesus, Jesus Christ, K.P. Yohannan, ministry, Missionaries, Missions, service on July 1, 2010 by gfaseo. Back in the 80s I had the opportunity to visit with Keith Green and the staff of Last Days Ministries. For a long time, I had received their newsletters and was quite impressed, thinking they must have some of the finest graphic designers working with them. However, during my visit I came to discover that the artists designing the Last Days newsletter weren’t trained professionals at all! They were just kids from the streets whose lives had been changed by Christ. Having given up the right to run their own life, these men and women simply served at Last Days Ministries the best they could. And because of their surrender and dependence upon what Christ could do through them, they were used to do great things. Even though I’ve seen God use untrained men and women countless times, my eyes still search for the professionals. Just yesterday, I was looking at an application of someone who desired to serve with the Gospel for Asia staff. The first thing my eyes went to was the section about the applicant’s education and experience, scanning what kind of training and expertise the person had. I am not saying there is something wrong with utilizing the gifts that God has given people or recognizing certain abilities—not at all. The leadership at GFA prays for God to bring people with specific skills and talents to work within the ministry. That is legitimate and appropriate. For it is God who gives us different skills, all so that we can use them to glorify His name. To one He gives five talents, to another two, and to another one, expecting us to invest them wisely (see Matthew 25). But I have seen time and again that a lack of education never hinders God from using an individual. Please understand; I am not making light of education, skills or talents. But I do believe that it is only as we surrender our abilities to Him—give up our rights to own and rely on our strengths—that He can use us to accomplish great things for Him. There are biblical examples of this. Just think of Moses. Having been raised in Pharaoh’s house, Moses received some of the best leadership training of his day. Certainly God ordained this training for Moses, knowing that he could use this later in his life when leading the children of Israel, right? But such is not the case. While Moses was in the desert as a criminal and serving as a shepherd (one of the lowliest of jobs in that day), God began to prepare Moses for fruitful service. How did God do this? By unraveling Moses’ confidence in himself, bringing him to the place where he even said, “God, I can’t do the job.” It was then that God was able to use Moses in a mighty way because he had nothing of his own to rely upon anymore—no previous training, no experiences to fall back on—nothing. Just simple dependence upon the Lord. The same is true with the apostle Paul. He was an incredibly brilliant, well-trained individual. He studied under Gamaliel, a well-known philosopher and theologian, and was perfect in the Law. He was a Pharisee of Pharisees. History tells us that Paul was trained to perfectly debate and defend his faith. In Philippians 3:4 (NIV), Paul says of himself, “If anyone else thinks he has reasons to put confidence in the flesh, I have more and he goes on to list his professional credentials—the things that, under the law, qualified him for service. “And I, brethren, when I came to you, did not come with excellence of speech or of wisdom declaring to you the testimony of God. And my speech and my preaching were not with persuasive words of human wisdom, but in demonstration of the Spirit and of power, that your faith should not be in the wisdom of men but in the power of God” (1 Corinthians 2:1, 4–5). It is not that God only uses amateurs, the poor, the uneducated and those who lack ability. It is that God will only use those who will depend on Him—those who will give Him the glory for is done. The real issue is not how much education we have or do not have. 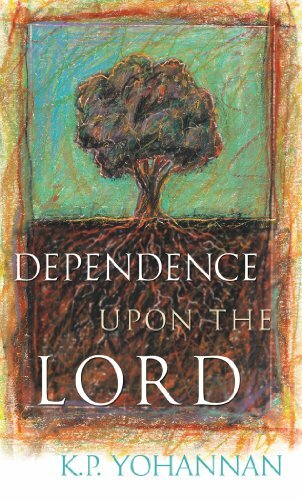 The real issue is whether we are dependent upon God. God wants to use us all—professionals and amateurs alike. But He is not going to bless a work that leads anyone to depend more upon his or her own strength rather than on the strength of God. Throughout his ministry, Paul learned how the “power is from God and not from us” (2 Corinthians 4:7, NIV) and how “our adequacy is from God” (2 Corinthians 3:5, NASB), not from our experience or training. Even after years of preaching and service to God, numerous churches planted and incredible fruitfulness of his ministry, Paul still said, “ I know that in me (that is, in my flesh) nothing good dwells” (Romans 7:18). In Philippians 3:3 (NIV), he said, “[We] put no confidence in the flesh.” May the Lord give us the attitude and understanding that Paul had in this—that we, in our flesh, are incapable of bearing good fruit that remains. But through Him, our lives can bear good fruit and bring glory to God. This entry was posted in Dependence Upon the Lord and tagged Bible, Christianity, dependence, Discipleship, encouragement, gfa, Gospel for Asia, holy spirit, Hope, Jesus, Jesus Christ, K.P. Yohannan, ministry, Missionaries, Missions, service on June 29, 2010 by gfaseo. In 2 Chronicles, we find the story of King Asa, ruler of Judah. Having inherited the throne from his father, King Asa tore down all the idols of foreign gods early in his reign and commanded the people to seek the Lord (see 2 Chronicles 14:2–5). Soon thereafter, an army of 3 million men and 300 chariots attacked Judah. With only a mere 580,000 men comprising his army, King Asa quickly called everyone before the Lord and prayed, “LORD, there is no one like you to help the powerless against the mighty. Help us, O LORD our God, for we rely on you, and in your name we have come against this vast army. O LORD, you are our God; do not let man prevail against you” (2 Chronicles 4:11, NIV). The Lord was faithful to deliver that great army into King Asa’s hands—because he looked to and depended upon Him. The Lord also granted his nation 20 years of peace after that battle. But oftentimes, the way we start out is not always the way we finish. And this is the reason why I seek to remind us that dependence upon the Lord is an absolute necessity if our lives are to bear any good fruit. We will never come to a place at which we will no longer need to look to God, depending fully on Him to provide strength, life and power. No matter what comes or goes, this spiritual truth remains central to the work of God in us and through us. Twenty years after experiencing God’s faithfulness, King Asa is faced with another battle. Baasha, the king of Israel, begins to attack Judah by walling in the city, letting no person or supplies in or out. King Asa panics and quickly sends word to the King of Aram, asking him to break treaty by attacking Israel, forcing King Baasha to abandon his attack on Judah to defend his own country. The king of Aram does so, King Baasha flees back home to fight off his new enemy and Judah is kept safe (see 2 Chronicles 16:1–6). “Because you relied on the king of Aram and not on the LORD your God, the army of the king of Aram has escaped from your hand. Were not the Cushites and Libyans a mighty army with great numbers of chariots and horsemen? Yet when you relied on the LORD, he delivered them into your hand. For the eyes of the LORD range throughout the earth to strengthen those whose hearts are fully committed to him. You have done a foolish thing, and from now on you will be at war” (2 Chronicles 16:7–9, NIV). From this Scripture portion, we see that God is not so much concerned with the end result as He is with how something is accomplished. If God were only concerned with the end result, He would have applauded King Asa for being so clever as to call on some distant king and devise such a cunning plan. But God clearly called King Asa’s plan foolishness because all of it depended on what man could do. In essence, for the end to honor God, the means must honor God. If we are seeking to establish a work that will remain for all eternity, if our lives and what we do are to last the test of time, then the motive and the means must be centered and dependent upon the Lord. What matters most is that God is the leading factor rather than our own strength and ability. This is because anything that is built on the ability, skill and expertise of men will never bear lasting fruit. We, like King Asa, can be deceived by quick results. True, everything may look wonderful in outward appearance—the elegance of buildings, the great number of people, the repertoire and esteem—but God looks past all these things into the heart. He knows whether or not a heart is fully committed to Him, leaning and depending upon Him above all else. He knows who has built the house and has said, “Unless the LORD builds the house, they labor in vain who build it” (Psalm 127:1). When we stop depending upon the Lord, our lives stop producing good fruit. This is exactly what happened to King Uzziah. Becoming king when he was only 16 years old, King Uzziah ruled in humility and depended on God to guide him and give him wisdom to rule. Second Chronicles 26:4–5 (NIV) says, “[Uzziah] did what was right in the eyes of the LORD. . . As long as he sought the LORD, God gave him success.” King Uzziah was successful because he depended upon the Lord. But sadly, as he became a more “competent” king, growing older and having some experience to fall back on, he no longer trusted or obeyed God. Instead, he did things his own way. Scripture says of him, “But after Uzziah became powerful, his pride led to his downfall. He was unfaithful to the LORD his God. . .” (2 Chronicles 26:16, NIV). His life ended in terrible tragedy; he became a leper. The same downfall also happened to King Saul. He started out little in his own eyes, trusting the Lord in the beginning of his reign. But soon things changed. He became prideful, self-willed and strong in his own strength, seeing himself as important and competent. He stopped depending upon the Lord, and it cost him his throne and his life. The Lord sets the choice before us to depend upon ourselves or to depend upon Him. The rest of Jeremiah 17 tells us the outcome of the man who, indeed, does rely upon the Lord: “Blessed is the man who trusts in the LORD, and whose hope is the LORD. For he shall be like a tree planted by the waters, which spreads out its roots by the river, and will not fear when heat comes; but its leaf will be green, and will not be anxious in the year of drought, nor will cease from yielding fruit” (Jeremiah 17:7–8). Let us be those people who choose the way of blessing by honoring the Lord with hearts dependent upon Him. This entry was posted in Dependence Upon the Lord and tagged Bible, Christianity, dependence, Discipleship, encouragement, gfa, Gospel for Asia, holy spirit, Hope, Jesus, Jesus Christ, K.P. Yohannan, living water, ministry, Missionaries, Missions, service on June 24, 2010 by gfaseo. “I am the true vine, and My Father is the vinedresser. Abide in Me, and I in you. As the branch cannot bear fruit of itself, unless it abides in the vine, neither can you, unless you abide in Me. I am the vine, you are the branches. He who abides in Me, and I in him, bears much fruit; for without Me you can do nothing. By this My Father is glorified, that you bear much fruit; so you will be My disciples” (John 15:1, 4–5, 8). In our walk with the Lord and our service to Him, we must continue in the reality of this timeless truth every day—that “as the branch cannot bear fruit of itself, unless it abides in the vine,” neither can we unless we abide in Him. My prayer is that you would grow in your dependence upon the Lord alone and experience the joy of a life lived in full reliance upon Him. Our next post will be Chapter 1 of this encouraging booklet. This entry was posted in Dependence Upon the Lord and tagged Bible, Christianity, dependence, Discipleship, encouragement, gfa, gifts, Gospel for Asia, holy spirit, Hope, Jesus, Jesus Christ, K.P. Yohannan, Lord, ministry, Missionaries, Missions, service on June 17, 2010 by gfaseo.